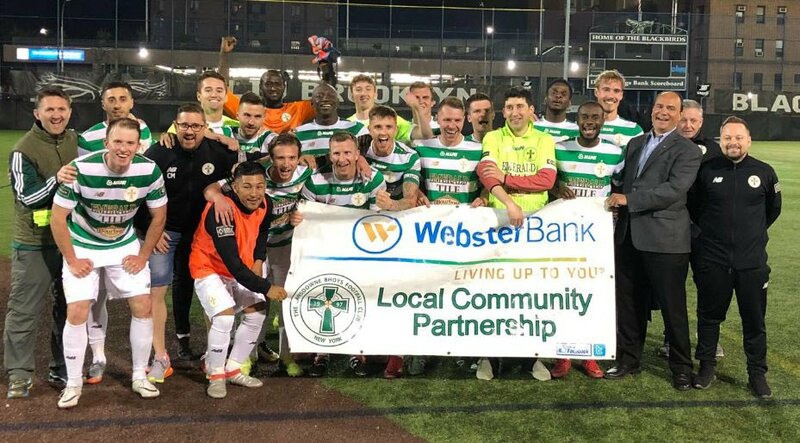 Lansdowne Bhoys players, board members and coaches posing for a picture after the club's 2-0 win over Brooklyn Italians in the Lamar Hunt U.S Open Cup's opening round. 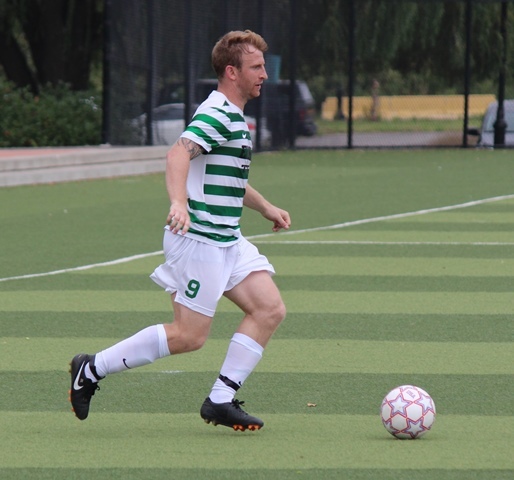 Lansdowne Bhoys blanked Brooklyn Italians 2-0 in the first round of the Lamar Hunt U.S Open Cup away from home at LIU Brooklyn Athletic Complex on Wednesday night. Lansdowne opened the scoring with the first shot of the encounter in the eighth minute. Michael Holzer charged down the right flank past two players before whipping in a cross to Daryl Kavanagh, who beamed a one-time shot in the net. Daryl Kavanagh put Lansdowne Bhoys up 1-0 in the eighth minute. Brooklyn’s two-goal hero in their last eliminatory round, Rasmus Hansen, attempted to level the scoring with a low screamer from out of the box. Hansen’s effort whistled past the left goalpost in the 18th minute. Three minutes later the Bhoys’ top scorer of the season Ovan Oakley charged down the middle of BK’s defense then rolled a pass to Kavanagh on his left. The Irishman cut to his right before steering a low-shot on frame, which opposing keeper Tyron Matuta voluptuously dove on his left for to prevent from entering the net. The home team had their best look at goal of the first half in the 43rd minute as Giuseppe Barone, who also plays in the CSL with NY Shamrock SC, set Hansen for a shot. The Danish striker whipped the ball on target from the edge of the box but wasn’t able to put the Italians on equal terms as keeper Abdoukarim Danso leapt to perform a breathtaking one-hand save. Two minutes after the restart Mamadou Guirassy attempted to pass a crowd of Brooklyn players in the box but was dispossessed. The NPSL club tried to clear the ball out of danger but it deflected on one of their players and rolled in the net. Later in the 66th minute, Guirassy forced his way through Brooklyn’s defense again and was able to get a shot in this time, hammering a low-drive toward the left near post but keeper Matuta stuck a foot out for a dazzling kick-save. As Lansdowne sat back late in the game and looked to run out the clock, the Italians had a couple of goal scoring chances, one of which was when Thomas Suchecki blasted an open shot just over the bar in added time. The Bhoys held on to their 2-0 lead until the referee blew the final whistle. The three-time CSL champions will travel to Sahlen’s Stadium next Wednesday to take North Carolina F.C at 7:00 p.m.
1. Clean sheets in half of their Open Cup games now: Lansdowne’s clean sheet versus Brooklyn Italians was their second one in four Open Cup games. The Bhoys drew with Pittsburgh Riverhounds 2-0 in the second round in 2016 for their first clean sheet. The Irish club conceded three goals in their four Open Cup matches. 2. The referee might need a new whistle after this one: As expected of an Open Cup game, it was a physical affair between the Italians and the Irishmen as the two teams shared 26 fouls, 12 for Brooklyn and 14 for Lansdowne. 3. Kav been scoring since the qualifiers: Before scoring the opener against Brooklyn, Daryl Kavanagh netted a brace in the Bhoys’ last qualifying round versus Junior Lone Star U-23 in a 3-1 win. 4. Minor hit for the Bhoys: Starting left back Jean Voltaire was subbed out in the 67th minute after re-picking up a groin injury. 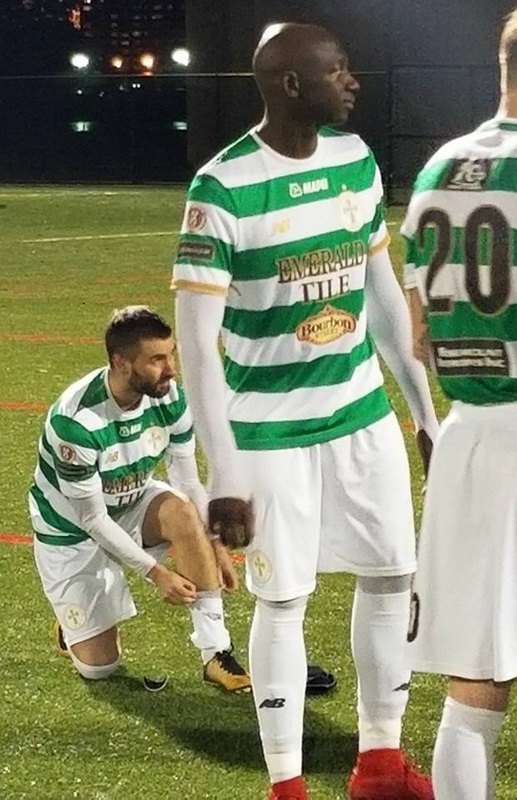 However Voltaire is likely to return back to action for the Bhoys’ next Open Cup game on Wednesday versus North Carolina F.C. Lansdowne Bhoys veteran striker Daryl Kavanagh was thrilled that the club moved to the next round. “I'm very excited considering it's such a big competition over here and the fact that every single player worked so hard we deserved the win,” Kavanagh said after the match. The Irishmen praised the team for the way they started the match and for their collective pressure. The former League of Ireland player netted the Bhoys’ opener in the eighth minute. Kavanagh expressed that he entered the match expecting to hit the net.